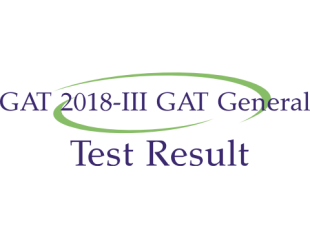 NTS Graduate Assessment Test GAT 2018 III GAT General Results check from here. GAT General 3 was held on Sunday, 15th July 2018. GAT is the short form of Graduate Assessment Test. Their are two categories of GAT. First is Gat General Test while the second category is name as Gat Subject test. GAT GENERAL is kind of test which is held for the admission of M.S and M.Phil students. The result of GAT General as well as Gat Subject remains valid for two years. If any student wants to get admission after two years of passing NTS GAT test. Then he must appear in GAT General again, and the previous result will not be valid for this admission. GAT Subject is for admissions in Ph.D programs. The purpose of GAT Graduate Assessment Test is to analyze the Quantitative as well as analytical skills of the students. Graduate Assessment Test paper type is name as GAT A, GAT B and GAT C.
Result is available here as well as on the official website of National Testing Service. Graduate Assessment Test GAT 2018 III result can be check in two following ways. You can also check your result of GAT test by entering roll number. You can download as well as take the print of NTS Graduate Assessment Test GAT 2018 III GAT General Results answer keys . Press Ctrl+P in order take the print of GAT General III result.